Buhari was keen on signing the proclamation before his departure for New York in order to have the right response at the UN general assembly. President Muhammadu Buhari has reportedly signed a presidential proclamation proscribing the Indigenous People of Biafra (IPOB). According to a report by THISDAY, the move is to take the heat off the army and to ensure that due process is followed. It was further reported that the president signed the proclamation on Sunday, September 17, 2017, before his departure for the UN General Assembly in New York. The report also revealed that a source in the attorney-general’s office explained that the presidency had effectively initiated the formal process of proscribing IPOB in accordance with the provisions of the Terrorism (Prevention) Act, 2011”, and that “it had also paved the way for the attorney general of the federation (AGF), Abubakar Malami (SAN) to head to court to give legal backing to the presidential proclamation”. It also cited sources as saying Buhari was keen on signing the proclamation before his departure for New York in order to have the right response in the event that the question over the declaration by the army was posed by other world leaders who have been watching events in Nigeria. 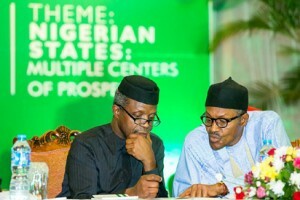 “The issue was extensively debated between Buhari, the AGF and other aides before he left for the UN General Assembly and the president decided to sign the declaration before leaving for New York, so he could say that due process was being followed if the question was raised by other world leaders at the UN,” the report quoted the sources as saying. On Friday, September 15, 2017, the defence headquarters (DHQ) declared IPOB a “militant terrorist” organisation. South-east governors subsequently issued a statement, proscribing the group. On Monday, Senate President Bukola Saraki described the action of the military and the governors as unconstitutional saying due process was not followed in the proclamation.